Spring call is likened to the tolling of a soft bell. Also gives high-pitched whistles. Description: Sexes similar. A chubby owl. Flat-headed; chocolate brown back with white spots; white underparts streaked with chocolate brown. 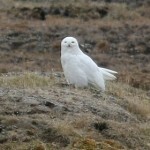 Whitish facial disk bordered with black; yellow bill and eyes; short-tailed. 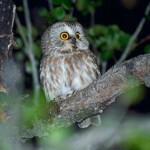 Juvenile is similar to adult but has chocolate brown underparts that lack streaking. Where in Nebraska: Accidental. Most recent record is from Webster County in 1963. Field Notes: Irruptive, but usually in small numbers. 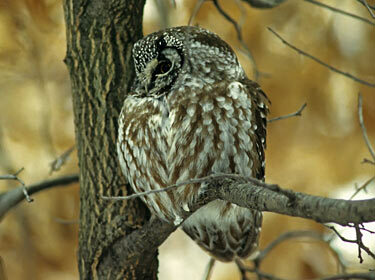 Fun Facts: Boreal Owls main food source, or prey, are mice. 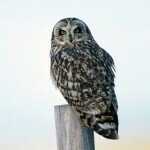 When mice levels are high Boreal Owls may mate with more than one partner however, when mice levels are low Boreal Owls are monogomous.